Perak, Pahang (Main Range at Cameron Highlands and G. Tambang Batak). Endemic. 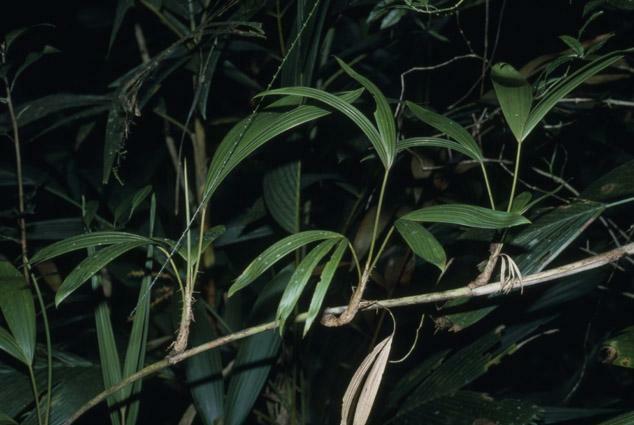 Clustering thicket-forming mountain rattan with slender stem often branching, to about 6 m tall, without sheaths about 8 mm in diameter, with sheaths about 1.5 cm. Internodes about 18 cm. Sheaths pale brown armed with scattered narrowly triangular flattened spines held horizontally, the largest to 20 mm long by 5 mm wide at the base, with few smaller spines scattered in between; thin brown indumentum in between spines. Knee well-developed. Ocrea to 5 mm high, tattering. 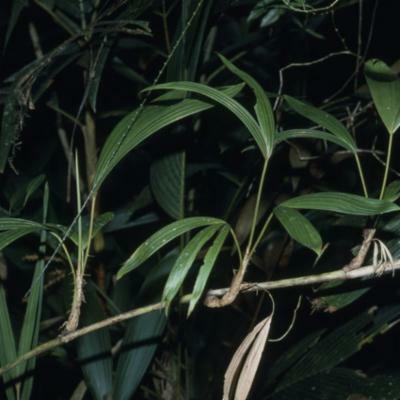 Leaf cirrate to 2.0 m long; petiole to 15 mm long armed with spines as on the leaf sheath, leaflets about 5 on each side ofrachis very broad, arranged alternately below, subopposite above, in most robust plants 60 cm long by 10 cm wide (Furtado 1956), usually about 30 cm long by 7 cm wide, with about 5 main veins, the margins black bristly at the tips only. Inflorescence up to about 80 cm long, shorter than the leaves, bearing about 6 partial inflorescences evenly distributed; bracts covered in pale grey indumentum and scattered scales almost inerm. Partial inflorescence in female consisting of 1 rachilla only; in male sometimes with 3-4 rachillae. Flowers arranged neatly in 2 rows. Fruit globose, very large, about 3 cm high by 2 cm in diameter, tipped with a short beak, covered in 24 vertical rows of pale brown to red-brown black-tipped scales. Seed globose, about 15 mm in diameter, with deeply ruminate endosperm. Seedling leaf unknown. Collected by Orang Asli - apparently a good cane.